It's official, your canine companion won't just be another AI squadmate. There are many things in the new Call of Duty that Infinity Ward would like you to be excited about, but the one getting all of the internet's attention is the now-famous military service dog in your squad. 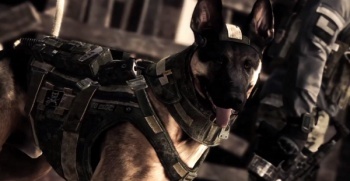 It seems we can stop wondering about what role the little guy will play in the game's campaign - a pre-E3 sneak peak at the single-player campaign of Call of Duty: Ghosts has revealed the dog to be a playable character in certain missions. Hopefully it's obvious that you won't be strapping an M4 to the hound and sending him off to crouch behind chest-high walls, so the dog sections will involve a shift in gameplay. In real life, the military uses highly-trained dogs in the field as remote reconnaissance, and that's pretty much what you'll be doing in Ghosts. A mounted camera lets soldiers see what the dog sees via a handheld viewfinder, and an earpiece allows the team to give orders from afar. Stealthy situations will call for a more subtle method of instruction, so small vibrations on the dog's collar let teams direct him silently. It seems a little hard to believe, but Infinity Ward says they've done their homework and this is how actual Navy SEAL teams operate with service dogs. Of course, this is a game, and it's more fun to actually be the dog than it is to hope the animal correctly interprets your commands. In Ghosts, you'll control your canine squadmate just like any other character, attacking hostile soldiers with vicious lunges for the throat. We're talking about man's best friend though, so the dog will also work together with his bipedal squadmates to distract enemies by barking, luring them into your sniper's crosshairs. It sounds like the dog portions of the game won't be too different from previous games' drone or helicopter segments. There's no word on whether you'll be able to directly control a dog in multiplayer, but if so, I'd gladly trade my grenades for a tactical T-bone steak as a counter.